The Yantra should be kept infront of you and then sincerely worshipped by lighting a Diya and incense stick infront of it. 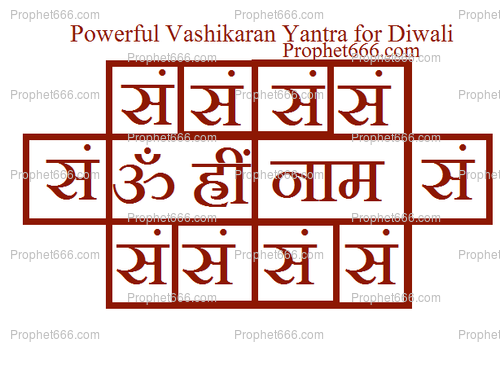 Then the Vashikaran Mantra given below should be chanted for 108 Mantra Recitations using a Rudraksha Japa Mala. This is the infusing Kriya, wherein the Tantra becomes infused with the Vashikaran Mantra. After this, this Vashikaran Yantra can be kept on the body in a Metal Locket either around the neck or on the wirst like a Lucky Charm. Notes- This is a general purpose Vashikaran Sadhana, which will enable the practitioner to appear attractive towards every person, including a husband, wife, lover, boos, co-worker or business associate or colleague. The Diwali Tithi is the most favorable period to perform this Vashikaran Sadhana, however, it can be also performed on the night of any other most auspicious Hindu festivals, Tithis or Astrological Shubh Muhurat. There are many special remedies of all kinds published on this site, you can always check to see which ones suit your problems. Sir.......प्रैक्टिशनर - या ने जो ये मंत्र करे खुद उसका नाम लिखना है ... Ashtagandga असली मिलता नहीं ..क्या आप दे सकते हो ...?. Yes, the word practitioner in the context of this post means the person who is going to use this Yantra. Ashtagandha is the recommended material, it cannot be replaced. The Rudraksha Mala should be used and it can be found easily in most places in India. Neel Sir, In case we do not have Rudraksha Mala is it OK if we do counting using digital tally counter. Digital or any other counting counter should not be used and the Mala specified in the post is most suitable for the mantra experiment. can more than one yantra be used at a time or can more than one yantra be inserted in the same tabeez or amulet ,like two vashikaran yantras..? The Yantras should not be inserted in the same amulet/locket. Two Yantras for the same purpose should be avoided otherwise you can use multiple Yantras for different purposes. Any kind of pointed wooden stick will do for writing the Yantra. Respected Neel Sir, I have previously benefitted a lot from one of your other health prayog. two mala daily. I wish to continue this Jaap till next year Diwali. Please suggest if creation in morning was fine and continuing the Jap is also fine.Your reply would be obliging, motivation and blessing. That's ok, you can continue the experiment as desired by you. Respected Sir, Saadar Charan Sparsh, I am so honored and motivated by your reply, never expected that you would reply. You are doing such a great job towards mankind via this spiritual guidance and motivation. Now my experiment is more meaningful as I have your(Guru’s ) blessings and consent. Hope you had a spiritually enlightened Deepawali festival. With your blessings provided last year, you permitted me to continue the Jaap of this mantra. I could continue the Jaap whole year and this year I prepared the Yantra again (as last year there was a confusion of Tithi and timings), with your blessings only I could fulfill my sankalp and complete this year of Jaap. I wish to continue this Jaap with my daily Pooja, I do a 3 mala daily with additional Jaap on all special occasions like Holi, Grahan, and Nishith kaal during Deepawali. Please spare a word of blessing for me, I would be encouraged to move forward on this spiritual path. I pray to the almighty to bless you with long spiritually topped life full of best health, peace and prosperity. Happy Deepawali and great year ahead. You can continue with the Mantra Japa as it has proved to be beneficial to you. Saadar Charan Sparsh, Thanks for your blessings, I am very blessed to have heard from you. Guruji, I apologize to bother you, but it is a matter of someone’s life, and infact 3 lives, hence writing this request, my female colleague’s brother and his wife are living apart and their 3 years old son is suffering, there is no significant cause and seems just stubborn ego issues with the girl. Guruji I made this request to you previously also and you asked us to do a wish fulfilment prayog from the site. Which my friend is continuing. But Guruji is there is paryog which a 3rd person can do to generate/enhance love between two individuals, I think as of now there is no such proyog mentioned on the site, I humbly request you to guide with one, so that the sister can do for his brother and wife, and hopefully they get talking and that kid’s life is gets on track. Brother does not do that much Pooja rituals so he can do any other attraction prayog so some else has to do this for them. I hope this if published on site would help many others, where someone else want to do for their children/relatives etc. Respected Sir, Saadar Charan Sparsh, i know i am bothering you so much on this, i apologize. I wanted to know which devta/ devi is stith in the beej of this mantra, or which devta is invoked in this. As while my daily jaap i want to worship and focus on that devta in my mind when in jaap.I think they are Kaamdev, Mahamaya and Laxmi. But i am not sure, please advice. You are correct, if comfortable and well-versed in focusing, you could do what you are intending. Otherwise, there is no need to focus on any deities while chanting the mantra because the sounds become vibrant with the chanting of the mantra. Respected Sir, Saadar Charan Sparsh, Thankyou so much for all your replies, I am so obliged for this, your words help people like me to get more conviction and direction to walk to this path correctly. I have no bad intentions by provoking the Shakti of this yantra & mantra, if they ever bestow me with some blessings, I will help the needy people, like talking to NGOs and authorities and getting them required favors like a poor boy lost his eyesight and for cornea replacement he needs funds, and people turn him down. I will sometime later take your guidance and devote myself to a sadhana that takes me closer to god. I forever pray for your wellbeing. Respected Sir, Lots of respect and Regards, sorry to bother you again, but this is serious as a kid's life is on stake. My friend's brother and his wife are in a very bad phase of realtionship and at the brink of seperation, kid is one and half years and his fate is uncertain. Wife is at her parents and causing so much agony to the husband, she is under some family member's influence. Is there a way that my friend can do something to save this relationship, her brother is emotionally broken, my friend is a female, please tell a prayog or a link that this lady can do to save her brother's family and their family perstige. Please i request your help. i did not find something suitable prayog which a 3rd person can do to bring two people closer. 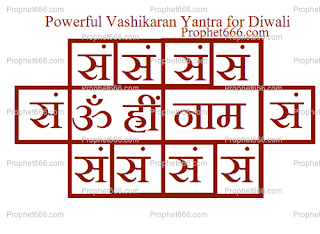 There are many Mantras given on this site to fulfill wishes, you can do a site search for a Mantra to fulfill your wish. I am really writing this today not to ask for anything but to express my gratitude and thanks for guiding us all on the path of spirituality. This mantra you gave for this Prayog, as I had taken your permission I have been continuously doing Jaap of this mantra, I have been continuing my Jaap since last year’s Kartik Purnima, with special jaap on Holi and Grahan. I wanted to pass on this info to you (i know you already know) that this mantra is a living mantra (Jagrit) and is a really powerful mantra, not that I have got what this prayog is designed for, but this mantra gave all signs of its power, form all initial tests and difficulties, then later provide evidences of it’s power and the presence of shakti’s/deities in it. Their blessings itself is an achievement, worldly needs are too small to ask for. Thanks a lot Guruji. I know for many in this world these things mean nothing, but for those who do these are blessing from our shastra’s and passed on further by people like you. Please bless me and all!. are suitable for the brother of your friend, provided he has belief and self-confidence. Thanks a lot for your reply, I feel very sorry bothering you again and again, actually Guruji we need a prayog that someone else (sister, mother, father) can do for the pair (husband –wife), since girl is away and the boy does not know anything about pooja/rituals (even if he does it may be error prone), I saw the post that you recommended in the comments section many people need this kind of Prayog where someone else performs it for the pair. In my case my friend will do for her brother and his wife. Forgive me for troubling you again and please show us a way. to fulfill the wish you have in mind. Thanks a lot for your guidance and support, hopefully with you blessings and kind kripa of Ganesh Ji our wishes would be fulfilled. Sir, I have some house problem. With my own money I built my own house this was registered to my father's name and he passed away. Now my brothers and sisters are not allowing me to sell the house as they need shares. As they said it is with the fathers name. My mother also passed away. Sir, with my hardly earned money I invest in the house and now they not allowing me to get my money back. Pls give a remedy to solve the problem. Is there any mantras to convince them to release my house.